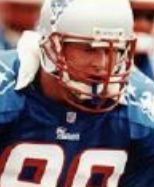 Steve DeOssie was a linebacker and snapper with the Dallas Cowboys, New York Giants, New York Jets, and New England Patriots. Named NFL’s Man of the Year in 1996, DeOssie retired from the game at age 35. He now divides his time between his three children, his wife (who he says forces him to work out), his new profession as a radio broadcaster, and his pursuit of the perfect golf game.